… and I don’t mean hedge fund … oh wait maybe I do. Autumn came visiting this week – actually make that “crash landed” on London from a great height. One day we’re basking in 29 degrees Celsius (84F) and the next day the mercury had plummeted to 19 (65). As I shivered in my summer clothing for lack of checking the weather forecast, I cheered myself by thinking “but Ted Autumn is your favourite season when natures bounties quite literally fall at our feet and all we need do is bend down and pick them up". A stalwart of the English countryside “hedgerows” are rows of closely planted trees and shrubs that in the past were a means of marking boundaries and keeping livestock in or out of fields. Nowadays they still perform that function, are important in the battle against erosion, and provide habitats for wildlife. They also contain plants that yield up their seasonal goodies like sloes, plums that are best either cooked or steeped in gin or vodka for a lovely winter tipple. Popular in hedgerows and also cultivated, mostly in Kent, the Cobnut is a member of the hazelnut family and was introduced to Britain by the Romans. They were hugely popular in Victorian times, partly due to the fact that they were planted next to fields in which grew another Kent stalwart, hops for beer brewing, and the working class families that travelled from the cities to pick hops on their holidays quickly discovered the unique and sweet taste of these little nuts. The rich of the day were not ones for missing out either and hence cobnuts graced the tables in grand country houses and were regarded as a very fine desert indeed. 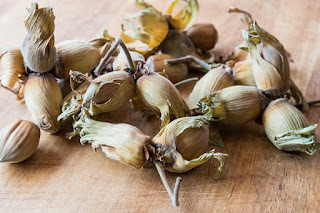 Cobnuts were widely travelled little nuts because they remained fresh inside their husk for months and thus were sent on many a long sea voyage of discovery. The poor old cobnut gradually fell from favour despite its sweet moist coco nutty like flavour – replaced in the public's favour by imported hazelnuts from Italy and Turkey. Today only about 250 acres of cobnuts are still producing crops commercially, with varieties like Frizzled Filbert, Mereville de Bollwiller (more easily pronounced as Hall’s Giant) Ennis and the ever popular Sicklers Zellenuss. Popular with who Ted? 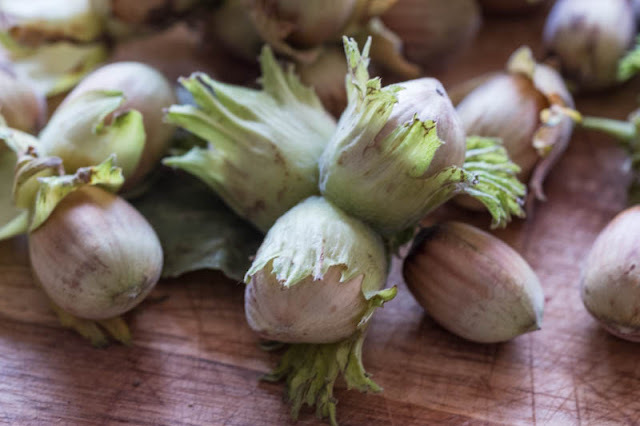 Well the focus on saving old varieties of all things edible and the resurgence in grow and eat local has certainly seen the Cobnut reappear in good grocery stores and markets for its short season to be discovered anew. I've learned something new this morning. I had never heard of cobnuts before. 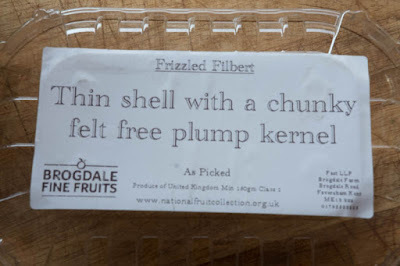 You've described them deliciously. I've never heard of them before either. Now, Ted, go read the Doll's post from tomorrow (I am reading the posts backwards) and see her critique of a natural grassy rooftop environment. You need to talk with her about developing an appreciation for what look like a tangle of weeds but are really rich environments.